Artist Manisha Gera Baswani’s latest obsession, or should one say compulsion, is feathers. Has been for a while. 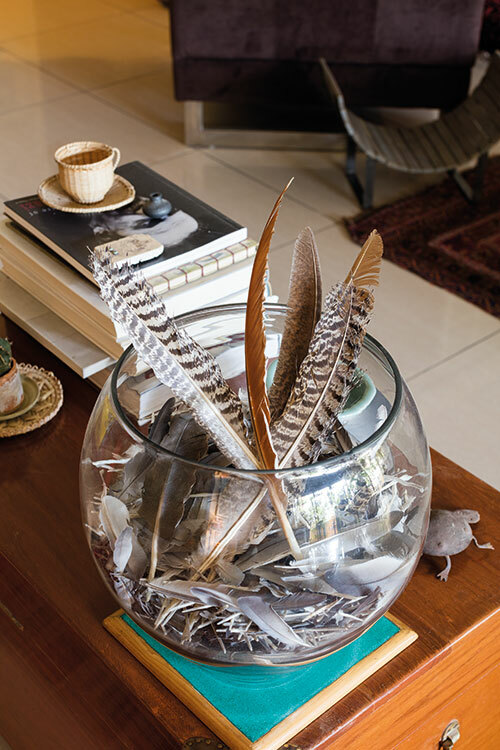 A large glass bowl full of them, collected by friends, neighbours and even her driver, sits pretty in her living room. Everyone in Central Park, Gurugram knows! And they have found their way into her work — large watercolours of detailed feathers or intricately woven plumage will make up her next installation series. Fabulous, awe-inspiring, large. Unlike her earlier works that were detailed and full, the latest series is sublime and sparse with a lot of white, reflecting the space that Manisha herself wanted. Another canvas shows up one typical day’s SMSs — to her mother telling her that she’ll call later, to her driver asking him to pick up boneless chicken and Disprin and to go to the cobbler, to her father, to her friends…. Her day, thus, determines her work and her work determines her day. Her latest installation that has not been shown yet “sprang from the whole idea of ‘moving’. When we shifted to Gurugram, it was a physical shift. But we shift mentally, we shift spiritually…. And when we shift, we take cover under whatever we have shifted with and that gives us comfort and the strength to then go out and face everything.” Gazing at that enormous, delicate, ephemeral piece, I understand just what she means. A comforting tent! One of her pet budgies is sitting inside, waiting to give birth. Some of the others chirrup and fly around the room as we speak, sitting every now and then on large-as-life statues of St Peter and St Paul that Manisha and her husband Rahul had picked up at Jew Town in Kochi. Walking into her abode, I am not prepared to see so much art. A bagh made by her great-grandmother for her grandmother’s wedding is what I notice first — subtle, perfectly intact. Very little of the art on display is her own work, though she does keep at least one piece from each of her exhibitions. 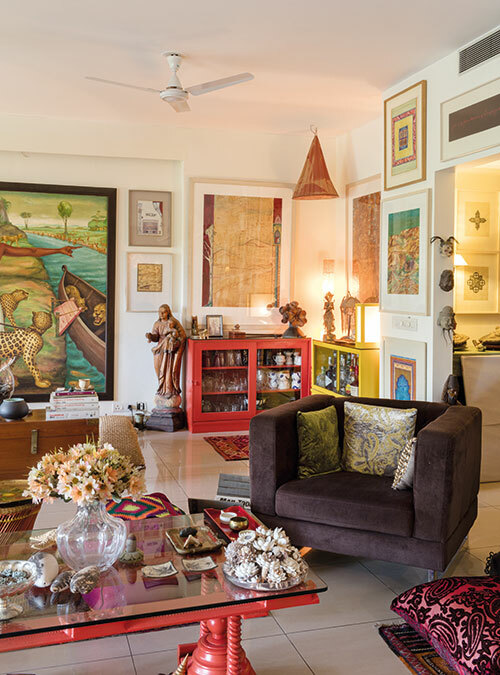 Paintings gifted by her guru, A. Ramachandran, have pride of place. I notice whimsical touches — twigs picked up during a walk around the complex, unusual seeds artistically arranged. 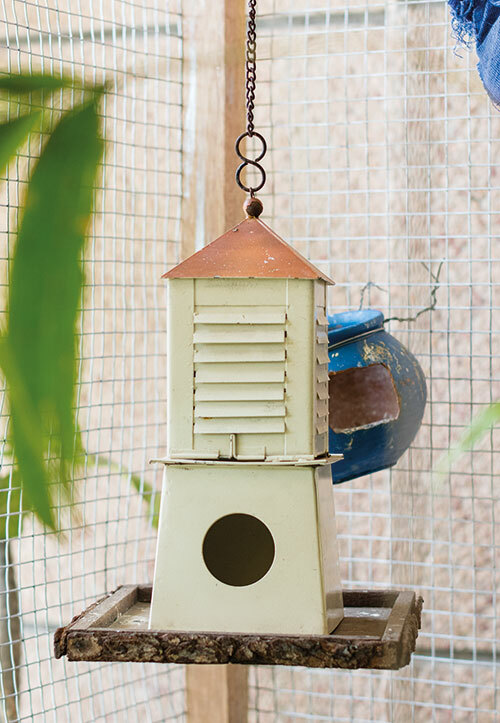 The amaltas seedpods are ideal for the budgies to perch on. 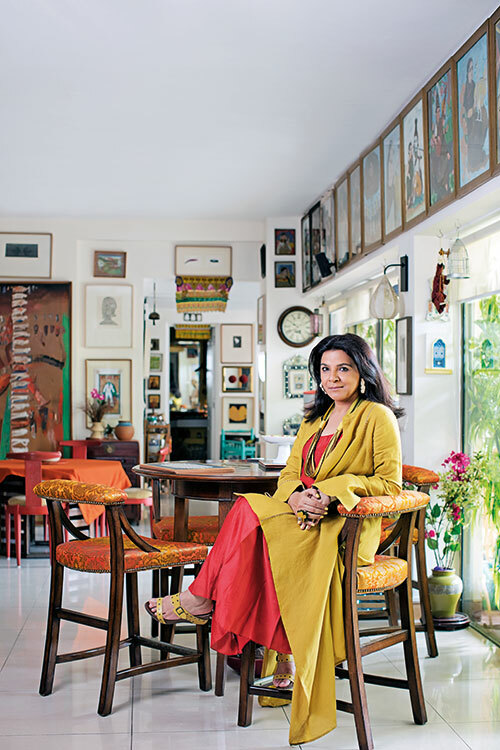 Her father’s typewriter sits cheek by jowl with a pair of interesting brass-and-steel scissors picked up at Pragati Maidan, and is watched over by old portraits of patriarchs and matriarchs. Early Tanjore paintings are everywhere. At college, in Jamia, she studied under prominent artists like A. Ramachandran, Paramjit Singh and Rajeev Lochan, and considered herself ‘blessed’ to have had such great teachers. She studied French simultaneously, which turned out to be a fortuitous decision that helped her to get an art scholarship to Paris in 1991. She joined Indira Gandhi National Centre for the Arts (IGNCA) after her return, to research the far-reaching influences of the 12th-century Sanskrit poem Gita Govinda by Jayadeva. Manisha started documenting her time with Ramachandran very meticulously; camera, Dictaphone and notebook in hand, sometimes with pre-prepared questionnaires on his role as a father, as an academic, on Shantiniketan, as a teacher…. “Again, this is not about him. It is about what he gives to me in terms of life and learning,” she maintains. 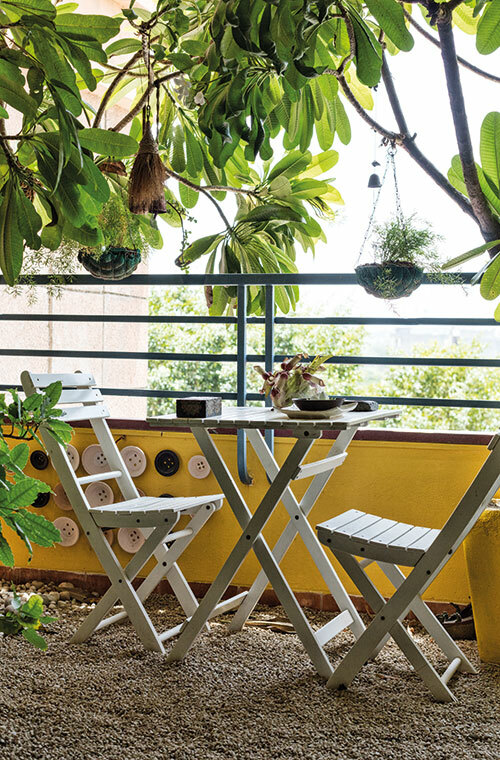 Then Manthan came along, a creative (not physical) space, started by Manisha, Rahul and three other couples, which provided a platform to creative people (designers, painters, musicians, graphic artists) to meet and discuss their work. The reason that they started this was to get to the ‘why’ of what they did. Five to seven events a year were held — self-funded and self-motivated. Manisha was the curator and Rahul was the MC. One year, when a Manthan session was being planned just after the India Art Fair, Manisha’s friends suggested that she speak about her photography project. That forced her to take out about 150 photographs shot over the last 10-plus years and she nervously gave a talk describing her journey. The appreciation she garnered from the art fraternity propelled her to visit studios and photograph artists in their private worlds, in their most sanctimonious spaces. Like a fly on the wall, she gathered inspiration while she was around these great minds. This was then taken up by the Devi Art Foundation as their exclusive project for the India Art Fair in 2012 and then at the Kochi- Muziris Biennale. “I wanted to extend this project to Pakistan, a desire that I had had since my first lecture at National College of Art in 1998. Both my parents are from there. All the stories that I’d heard as a child were from there and my husband and I love Pakistani art too.” She has a show coming up in Lahore in January 2017. She had held her first solo exhibition in Karachi last October (Hope is the Thing with Feathers, inspired by the famous Emily Dickinson poem) — the first Indian artist to do so after Partition. The welcome she received was overwhelming. But questions asked, on her return, about ‘them’ bothered her. She wrote about it…for people to read on both sides of the border. “If political spaces get difficult to manage, then creative spaces need to be opened,” she says. That’s when she started the Pakistani leg of her photography project Artist Through the Lens, which she plans to continue at Lahore. Having always been inspired by murals and miniatures, Manisha’s earlier series were very detailed and intricate, focussing on the use of tea water on paper. “I found my own rhythm with tea,” she muses. “These works have as many as 15 to 20 layers of tea interspersed with watercolour layers. I work on two works simultaneously because one layer has to dry completely before the colour sits on the other, or it will smudge.” Using thick cotton balls, brushes or even cloth, Manisha found her answers. She admits to being a slow artist, taking her time over each piece. There is invariably a gap of four to five years between her shows. “I am very happy with my pace,” she says. The budgerigars chirp in agreement as I leave, carrying with me some of the positive energy that is so important to Manisha.